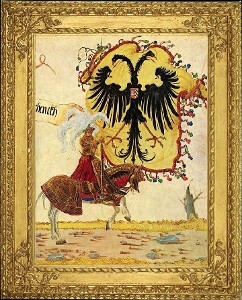 According to Meyers Konversations-Lexikon of 1897 (under the heading "Banner"), the German Imperial Banner at the time of Henry the Fowler (r. 919–936) and Otto the Great (r. 936–973) depicted the Archangel Michael; at the time of Frederick Barbarossa (r. 1155–90), an eagle; at the time of Otto IV (r. 1209–15) an eagle hovering over a dragon, and since the time of Sigismund (r. 1433–37), and "perhaps earlier", the Imperial Eagle, namely a black eagle in a yellow field, bearing the arms of the emperor's house on its breast. The Reichsfahne (Imperial flag) was a field ensign of the Holy Roman Empire, originally an equestrian flag or gonfalon. An early bearer was Werner I, count of Winterthur, who carried the flag for Conrad II and Henry III and who died in the battle at Br?dek in 1040. In the 12th century, the Reichsfahne apparently[clarification needed] showed a white cross on a red field. It was the sign of the united armed forces of the Empire until the late 15th century, but it could be sent by the king to local lords to sanction them in their defense of Landfrieden. Thus, king Sigismund gave the banner to the Swiss Confederacy, sanctioning their war against the Habsburgs in 1415. 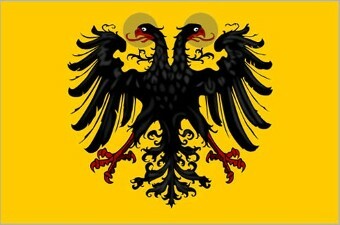 In the late medieval period, the cross design of the Reichsfahne was replaced by the Imperial eagle. It was treated as an Imperial fief traditionally granted to Swabian nobles. In 1336, it was granted to Ulrich III, Count of Württemberg. On this occasion it was first referred to as the Reichssturmfahne ("Imperial War Flag"). It remained part of the heraldic insignia of the House of Württemberg until the 19th century. The flag itself was kept in Stuttgart until 1944, when it was destroyed in a bombing raid. The flag showed the imperial eagle in a square field, with a red Schwenkel (pennon) on top. It is not to be confused with the Reichsrennfahne, granted to the Electors of Saxony in their function as Reichserzmarschall. This latter flag showed two crossed swords in a black and white field. 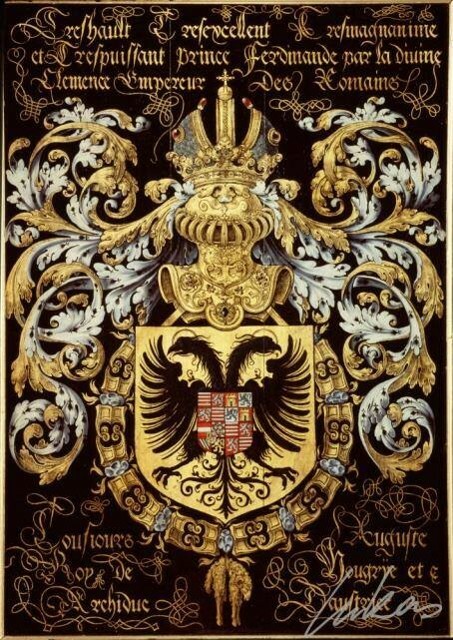 List of Free Imperial Cities and Coats of arms of the Holy Roman Empire and Other states, some free imperial cities took to displaying symbols of the empire, especially the Imperial eagle, as part of their flags or coats of arms. 15th century Flag of Geneva Geneva had the dual status of free city and Prince-Bishopric from the 12th century; this is reflected in the flag of Geneva, which since the 15th century has shown both the Imperial Eagle and a key of St. Peter, divided per pale.